I love Fall/Winter fashion and I am not quite ready to give up my cozy sweaters, but I am starting to crave some warmer weather. I also really want to take a tropical vacation so while I sit on my couch in a Patagonia fleece, my fave Zella leggings and moccasins, I am creating a list of all the items I can't wait to add to my wardrobe. Maybe, just maybe, I'll get to wear some of them walking in the sand and soaking up the sun. Well, I can dream can't I? I'm loving everything blush right now, but while I'm thinking ahead white and blue keep catching my attention. I like the crispness of the two colors and how lightweight and effortless the combination feels. 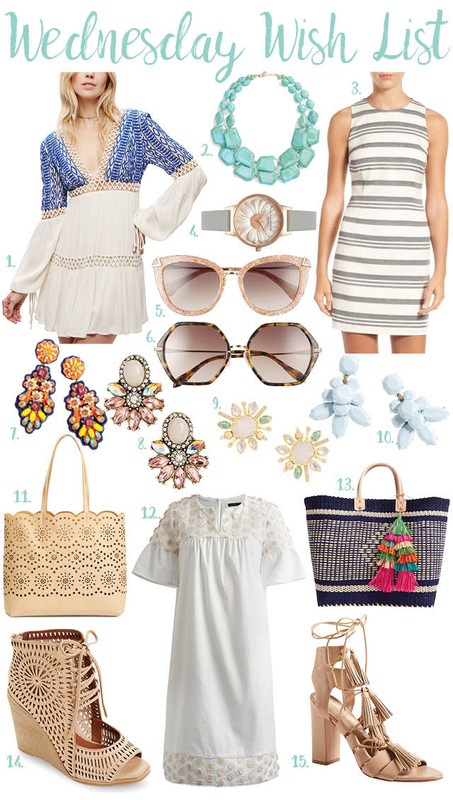 There's just something so summery about a crisp white dress and a splash of blue. I am so wanting to go get a pedicure and fall back in love with white polish. Then again I should probably get a tan first!! As for shoes — hands down my favorite thing to shop for — I am loving these strappy sandals. Last year I loved these Sam Edelman sandals (they're on sale now!! ), but the style and color are something I'm looking at again this year. Jeffrey Campbell's Rodillo wedges have been popular for the last two years, but I'm so happy I didn't give into temptation last summer. While super similar, I love the Rayos version so much more! I love a wedge or a chunky heel, so I can wear them all day. What trends are you excited about? What's on your Wednesday wish list? A little bit of Gingham!